NSW Councils use the Integrated Planning and Reporting Framework to plan for the future and respond to the needs of their communities. The framework allows Council to draw all of its plans together, planning holistically for the future. 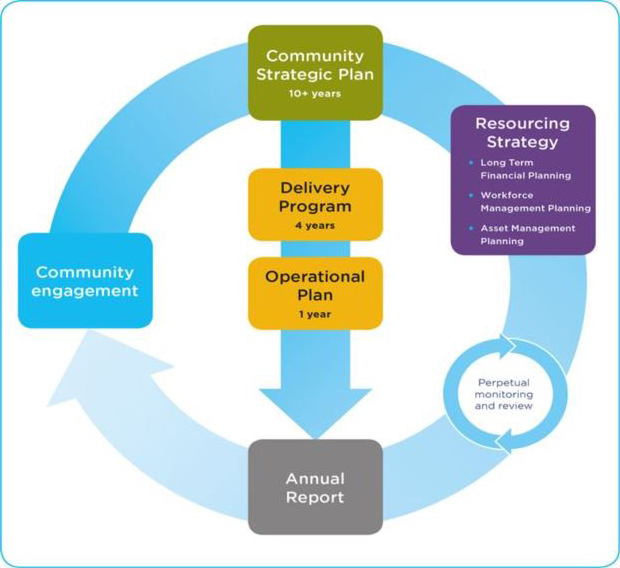 The Community Strategic Plan is the highest level plan that Council prepares, and all other plans and policies support the achievement of the community’s vision for the future. The aim of this integrated planning model is to ensure that Council is taking a long-term strategic approach to its activities and that these reflect the desires of the community. The Community Strategic Plan (CSP) outlines key priorities and goals for the next 10 years. The Delivery Program and Operational Plan outline how Council will meet the objectives of the CSP during its four year term. View Council’s fees and charges here..
Council’s comprehensive Annual Reports are prepared in accordance with the Integrated Planning and Reporting Framework. The Annual Report is released in November each year. The Resourcing Strategy details the resources in place to implement the strategies of the CSP.